American soldiers trade rations for cigarettes in food stores, and this is where you can buy them for 50 cents. 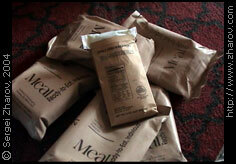 Which is a good deal if you know that in the US the surplus military equipment stores charge about 10 dollars per bag. Also, you can often buy main dishes separately for about 25 cents. Perhaps, the locals do not need the whole bag, which has a lot of stuff in it, so they disassemble the sets and sell them by parts. Besides, some of main dishes have pork in it, which can not be eaten by Muslims. Actually, presence of pork and beef in field rations produced for its own military by a country that is so diverse and officially tolerant is surprising. Apparently, Muslims and Hindus in the American military are expected to go screw themselves and their faith. In addition to field rations, there also are huge tins the size of a laptop that have things like pasta or cakes in them. They can feed a platoon and are obviously designed to be used in some kind of a field kitchen since no means of opening or heating them up are enclosed. You can buy them too, but remember that you can not finish four kilos of pasta with meat in one day, and there are no refrigerators available. And cakes get dry very soon. A field ration has about 1500 kilocalories in it. Therefore, two should be enough for one day. A main dish is 200–300 kilocalories, and you can imagine where the rest of it comes from: sugar in candies and fat in cheese and peanut butter. In addition to a main dish, there is instant tea, or coffee, or chocolate, and a pack of dry lemonade. There is no soup, and you get cookies, candies, cakes, or biscuits for desert. Some sets have bread and soft cheese. Each set has a glass bottle of Tabasco — would you believe it? To heat a main dish up, you have a special chemical set with carbide inside and instructions printed on it. You should pour water in it and, together with a main dish, “put it against a rock or something”. Acetylene quickly starts seeping from it, and this is when you understand the purpose of a matchbook enclosed in each set. Not only bread, but circus too. A 1.5-liter bottle of water is enough to organize a spirit-raising dinner. You need just a little for the heating element, a cup for a hot drink, and the rest for a cold drink. You have to heat water up for tea yourself, no means for that are provided in the set. The thick plastic bag can be reused for protecting books and other things in a backpack. These field rations can be bought in Kabul on Chicken Street and in Mazar-i-Sharif on the western side of the mausoleum of Hazrat Ali. I have not seen them anywhere else in the country. The following is the content of all 24 sets. For each one its number is listed, then the name of a main dish, then the rest of the set. In addition, each set has salt, two chewing gums, a book of matches, a few sheets of toilet paper, a wet tissue, a heating set, and a plastic spoon. 1. Beefsteak with mushrooms, western beans, peanut butter, crackers, beef snack, powdered beverage base, coffee, sugar, creamer, red pepper, candy, salt, chewing gum, matches, toilet tissue, hand cleaner. 2. Jamaican pork chop with noodles, spiced apples, jalapeno cheese spread, vegetable crackers, dairy shake, hot sauce, coffee, sugar, creamer, salt, chewing gum, matches, toilet tissue, hand cleaner. 3. Beef ravioli, potato sticks, cheese spread, wheat snack bread, fudge brownie, powdered beverage base, hot sauce, coffee, sugar, creamer, salt, chewing gum, matches, toilet tissue, hand cleaner. 4. Country captain chicken, buttered noodles, cheese spread, crackers, toaster pastry, candy, mocha cappuccino, hot sauce, coffee, sugar, creamer, salt, chewing gum, matches, toilet tissue, hand cleaner. 5. Grilled chicken breast, minestrone stew, jelly, wheat snack bread, fudge brownie, candy, cocoa beverage powder, instant tea with sweetener & lemon flavor, apple cider, salt free seasoning blend, salt, chewing gum, matches, toilet tissue, hand cleaner. 6. Chicken with Thai sauce, white rice, jalapeno cheese spread, vegetable crackers, raisin nut mix, fruit vanilla cappuccino, hot sauce, tea bag, sugar, creamer, salt, chewing gum, matches, toilet tissue, hand cleaner. 7. Chicken with salsa, Mexican rice, shortbread cookie, jalapeno cheese spread, vegetable crackers, candy, hot sauce, instant tea with sweetener & lemon flavor, salt, chewing gum, matches, toilet tissue, hand cleaner. 8. Beef patty, nacho cheese pretzels, cheese spread, wheat snack bread, BBQ sauce, powdered beverage base, hot sauce, instant tea with sweetener & lemon flavor, salt, chewing gum, matches, toilet tissue, hand cleaner. 9. Beef stew, jalapeno cheese spread, vegetable crackers, chocolate disk cookie, dairy shake, hot sauce, coffee, sugar, creamer, salt, chewing gum, matches, toilet tissue, hand cleaner. 10. Chili and macaroni, pound cake, cheese spread, wheat snack bread, cocoa beverage powder, coffee, sugar, creamer, red pepper, candy, salt, chewing gum, matches, toilet tissue, hand cleaner. 11. Pasta with vegetables in tomato sauce, hard candy, pound cake, wet pack fruit, peanut butter, crackers, instant tea with sweetener & lemon flavor, apple cider, salt free seasoning blend, salt, chewing gum, matches, toilet tissue, hand cleaner. 12. Bean & rice burrito, pound cake, fruit filled bar, wet pack fruit, peanut butter, crackers, hot sauce & picante sauce, instant tea with sweetener & lemon flavor, salt, chewing gum, matches, toilet tissue, hand cleaner. 13. Cheese tortellini, pound cake, hard candy, applesauce, peanut butter, crackers, instant tea with sweetener & lemon flavor, apple cider, salt free seasoning blend, salt, chewing gum, matches, toilet tissue, hand cleaner. 14. Pasta with vegetables in Alfredo sauce, pound cake, salted dry roasted peanuts, wet pack fruit, peanut butter, crackers, instant tea with sweetener & lemon flavor, apple cider, salt free seasoning blend, salt, chewing gum, matches, toilet tissue, hand cleaner. 15. Beef enchiladas, Mexican rice, chocolate chip cookie, powdered beverage base, jalapeno cheese spread, vegetable crackers, hot sauce, coffee, sugar, creamer, salt, chewing gum, matches, toilet tissue, hand cleaner. 16. Chicken with noodles, raspberry applesauce, cheese spread, vegetable crackers, candy, fig bar, cocoa beverage powder, hot sauce, coffee, sugar, creamer, salt, chewing gum, matches, toilet tissue, hand cleaner. 17. Beef teriyaki, chow mein noodles, jam, cheese and peanut butter cracker sandwich, candy, wheat snack bread, powdered beverage base, coffee, sugar, creamer, red pepper, candy, salt, chewing gum, matches, toilet tissue, hand cleaner. 18. Turkey breast with gravy & potatoes, chocolate sports bar, peanut butter, crackers, cheddar cheese pretzels, powdered beverage base, hot sauce, coffee, sugar, creamer, salt, chewing gum, matches, toilet tissue, hand cleaner. 19. Beef with mushrooms, yellow/wild rice pilaf, jam, crackers, oatmeal cookie, cocoa beverage powder, hot sauce, coffee, sugar, creamer, salt, chewing gum, matches, toilet tissue, hand cleaner. 20. Spaghetti with meat sauce, cheese spread, toasted peanut butter crackers, hard candy, wheat snack bread, dairy shake, hot sauce, coffee, sugar, creamer, salt, chewing gum, matches, toilet tissue, hand cleaner. 21. Chicken Tetrazzini, pound cake, crackers, jelly, dairy shake, hot sauce, tea bag, sugar, creamer, salt, chewing gum, matches, toilet tissue, hand cleaner. 22. Jambalaya, candy, chocolate covered oatmeal cookie, cheese spread, wheat snack bread, powdered beverage base, hot sauce, coffee, sugar, creamer, salt, chewing gum, matches, toilet tissue, hand cleaner. 23. Chicken with cavatelli, pretzels, pound cake, peanut butter, wheat snack bread, powdered beverage base, hot sauce, coffee, sugar, creamer, salt, chewing gum, matches, toilet tissue, hand cleaner. 24. Meat loaf with gravy, mashed potato, toaster pastry, jelly, vegetable crackers, cocoa beverage powder, coffee, sugar, creamer, red pepper, candy, salt, chewing gum, matches, toilet tissue, hand cleaner.